To educate, entertain and enlighten. 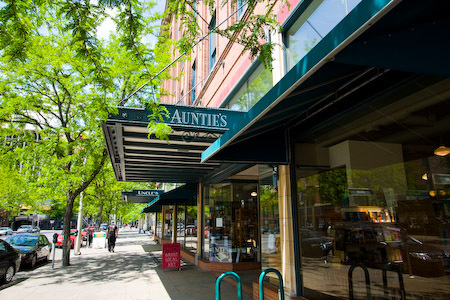 Auntie's Bookstore opened in 1978 in the Spokane Flour Mill under the name of "The Book and Game Company" and has been selling books ever since. Auntie's moved to its current location in the Liberty Building in 1994 located on the corner of Washington and Main. The store carries both new and used books, cards, tshirts, Spokane specialty items and other gifts to bring home for yourself or your favorite bibliophile. We are a full service independent bookstore! We offer bookstore credit for your gently used books, we hold events, signings, story time and so much more. Our booksellers love books and are looking forward to helping you find your next great read. If you're looking for a book and we don't have it in stock, we can get most orders in just a couple days.